It was Tuesday the second of December 1947 when Jenny the Spiddler walked into my office: almost a month before they nationalised my mother. Jack Wenlock is the last of the Railway Goslings: that fabled cadre of railway detectives created at the Weeping Cross Railway Servants' Orphanage, who trod the corridors of the GWR trains in the years 1925 to 1947. Sworn to uphold the name of God's Wonderful Railway and all that the good men of England fought for in two world wars, Jack keeps the trains free of fare dodgers and purse-stealers, bounders and confidence tricksters, German spies and ladies of the night. But now, as the clock ticks down towards the nationalisation of the railways Jack finds himself investigating a case that begins with an abducted great aunt, but soon develops into something far darker and more dangerous. 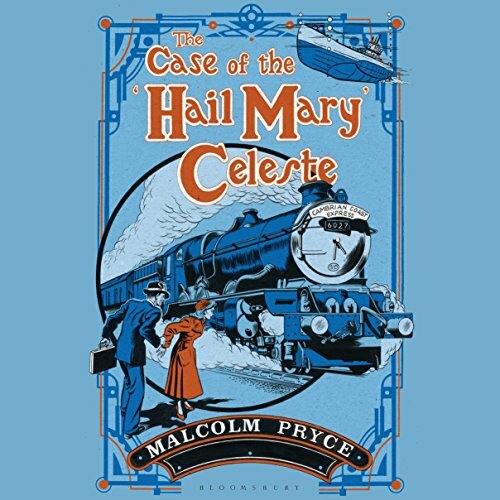 It reaches up to the corridors of power and into the labyrinth of the greatest mystery in all the annals of railway lore- the disappearance in 1915 of 23 nuns from the 7:25 Swindon to Bristol Temple Meads, or the case of the "Hail Mary" Celeste. Shady government agents, drunken riverboat captains, a bandaged book-seller, a missing manuscript, a melancholic gorilla and a 4070 Godstow Castle engine - the one with a sloping throatplate in the firebox and the characteristic double cough in the chuffs - all collide on a journey that will take your breath away. ©2015 Malcolm Pryce (P)2015 Audible Inc.
Cracking storytelling beautifully told. Why are there no Aberystwyth books available? Seems a real omission. As for this book, it's a real treat. Gripping, original and so well crafted. Some good ideas, some mad world building like Pryce's Aberystwyth books, but nothing really happens. And the reader has the creepiest, most patronising voice ever. The main character is supposed to be naive, but he reads him as a simpleton from a kids TV show. Perhaps I wasn't in the right mood but I found the story a kitch pastiche, and characters totally unbelievable - maybe that the point but in the end I found it so irritating that I didn't even finish it, which is most unlike me. Excellent Story by a great author. Very well read. Will Wenlock return? Beware of Room 42. 10 out of 5 for Ric Jerrom's astonishing reading of this beautifully imagined and crafted story. Odd and compelling.